SAN DIEGO — The decommissioned South Bay Power Plant, long considered a local “eyesore,” is scheduled to be imploded Feb. 2, weather permitting. Explosions will remove the mammoth structure and open up land that the Port of San Diego and the city of Chula Vista have designated for future public parks and development. The demolition of the decommissioned power plant is considered the first step in the Chula Vista Bayfront Master Plan. The implosion is scheduled for 7 a.m., and it will be carried out only under appropriate weather conditions — including wind speeds of 15 mph or less — as part of a comprehensive plan to protect air and water quality, according to the city of Chula Vista. The implosion plan is being carried out by the former plant operator, Dynegy South Bay LLC. It has been approved by the California Coastal Commission and the city of Chula Vista. A land and water perimeter will be set up to limit access around the site during the implosion process. This demolition will complete the Port of San Diego’s plan, made 14 years ago when it acquired the plant, to remove the much-criticized power plant from the waterfront. The South Bay Power Plant is a massive 165-foot-tall structure with an open steel framework surrounding boilers and turbines. It has been a fixture on the Bayfront since the late 1950s and was fully shut down at the end of 2010. Its main structure takes up around 13 acres on a 115-acre leasehold held by Port of San Diego tenant Dynegy South Bay LLC. Locals worked for years to push for the plant’s removal, asking state regulators to determine it was no longer necessary for the region’s power supply. The implosion is one visible indicator of Dynegy following through on its commitment to the port and the city of Chula Vista to demolish the site upon the end of its useful life, according to port commissioners. The power plant is situated within the area covered by the Chula Vista Bayfront Master Plan — a land-use plan that will transform more than 500 acres of waterfront property. Developed by the Port of San Diego, the city of Chula Vista and property owner Pacifica Companies, the plan was approved by the California Coastal Commission in August 2012. The plan includes a future resort and conference destination, more than 240 acres of parks and nature preserve, and a mix of residential and retail space. 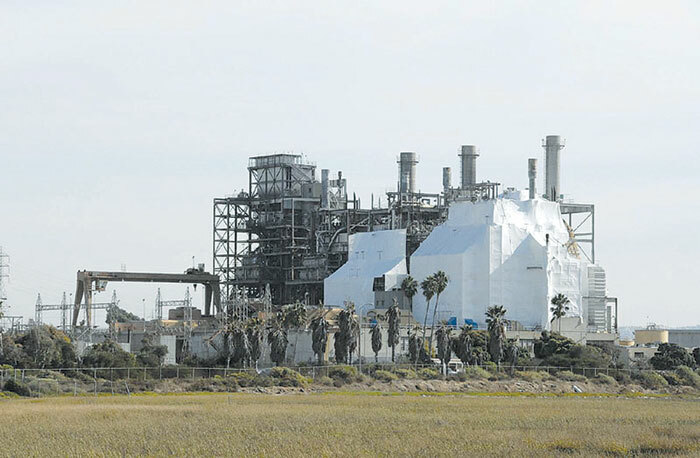 Under the Chula Vista Bayfront Master Plan, the South Bay Power Plant site and its surrounding land will eventually be replaced with a public park (24 acres), an RV park (14 acres), an industrial business park (two parcels, totaling approximately 36 acres) and a buffer zone around the western perimeter (25 acres). The actual implosion event will take less than two minutes and will reportedly sound like rolling thunder, with reverberations. A number of small, controlled explosive charges will be placed within the steel and concrete power block structure, in order to bring it down. Heavy equipment will then be used to break up the structure. The project is expected to generate about 21,000 tons of recyclable metals and up to 3,400 tons of other non-hazardous waste, which will be recycled and salvaged. Details of the Port of San Diego’s public viewing event will be announced in the coming weeks.